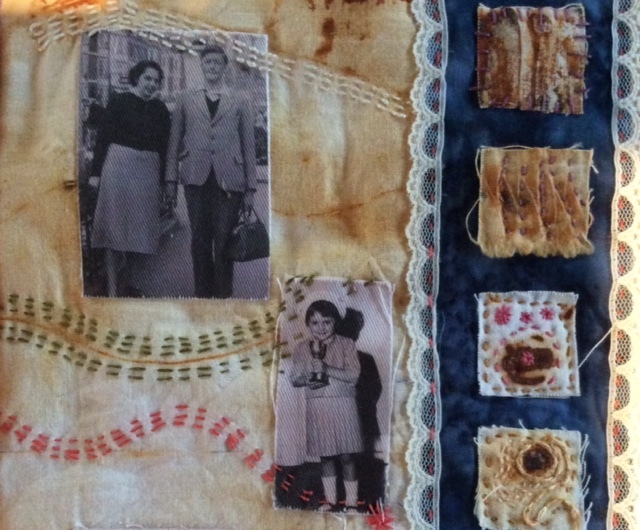 Stitching my relationship with my mother. It’s Mothering Sunday and my twitter feed is full of tweets about and to mothers. A wonderful celebration of our mums. However, for some of us our relationship with our mother is, for all kinds of reasons, complex. Whilst my mother died many years ago my relationship with her is something I am still striving to understand. On days like today this challenge comes to the fore. Mum had a long standing mental illness which, eventually, resulted in her committing suicide. There is a long narrative that could be told around her illness. It dominated my teenage years and, suffice to say, had a significant impact on family life. It continues, to this day, to frame my relationship with her. Whilst today other people send cards, buy presents, cook breakfast I have dipped into a stitched journal I made. I love working with textiles, especially when hand stitching is involved. The pleasure of settling down with needle and thread and a good play on the radio is hard to beat. The gentle pace of stitching. The time spent sifting through your stash to find just the right fabric. 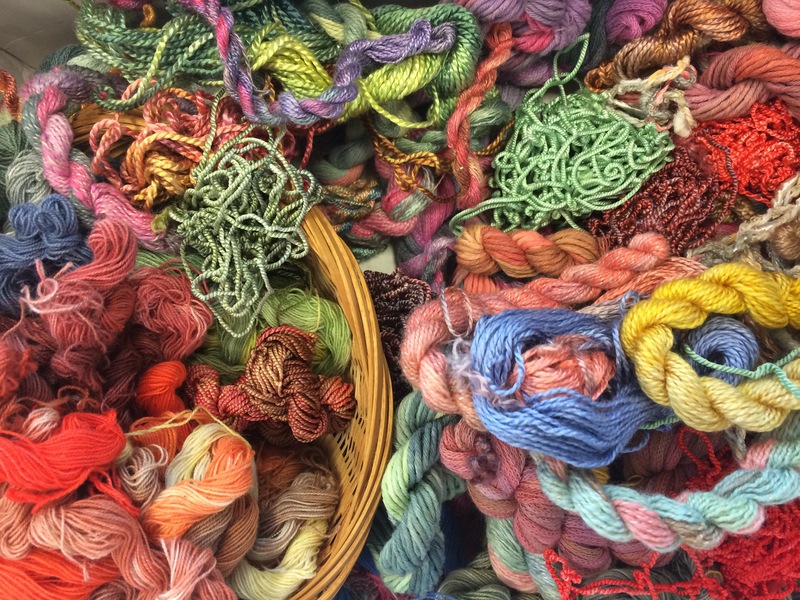 A world of possibility that lies in a box of threads. Sometimes a solitary occupation sometimes undertaken in the company of other women. The ebb and flow of chatter. The moments when the room goes silent as everyone becomes absorbed in their own private world. 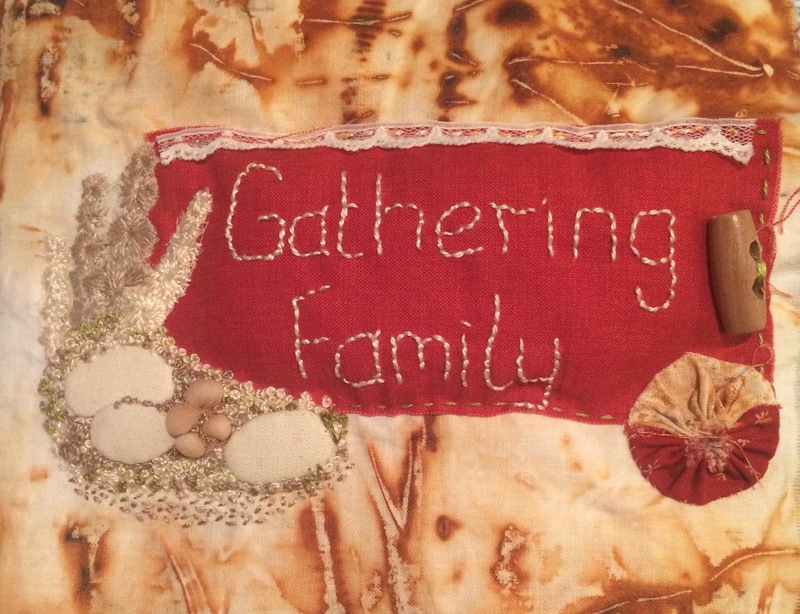 A while ago I stitched with a group of women to create a textile journal on the theme of ‘Gathering’. Led and inspired by our rather brilliant teacher Linda Robinson of Creative Threads Workshops. The whole experience, for me, become voyage of discovery. Rust dyeing and eco-printing involved gather bits and pieces from the house and garden to prepare the fabric. All of the stitches we learnt involved some kind of gathering. Then there was the decision about how to interpret the theme. The results were as diverse as the women in the group. I was pretty clear that I wanted to focus on gathering my family. It felt like a way of creating something personal using objects and pictures that have some meaning. At the time I didn’t really appreciate how impactful this would be. Thinking about the pictures and objects I might use led me to delve into the chest of keepsakes. I was on a mission to find photos of my family and, several hours later, had found so much more. As I sifted through long forgotten pictures a familiar narrative started to form. Photos of my wedding, my graduation, the day I was awarded my PhD. The always present absence. The person missing from the photos who chose not to be there. I know there is a bigger picture of family life but it is hard to shift this narrative. Of course there were periods of happiness, fun and laughter. They were there to see in the photos. There was absolutely much love and caring in our family. There was a time before mum became ill and there were periods when she was on more of an even keel. But what I hadn’t realised was just how much of the narrative surrounding my relationship with my mother had become defined by her illness. The treasures I found in that old chest? There was an old battered leather folder containing a parcel of letters that my parents had written to each other when they were courting. Real handwritten letters full of love and hope for their future together. Full of the sheer joy and happiness of being together. There were letters my father had written to my mother when she went into labour with my brother and in the days after he was born. Those were the days when men were sent away from the maternity ward. Told to wait for a phone call. Told adhere to strict visiting times. There were many happy photos from when they were first married and family photos of us doing all the things that families do. There was a ticket to a fashion show my mother had organised to raise money for our local National Children’s Home. Details of the thousands of pounds she had raised for this cause. The ticket connected me with her enormous capacity to give through all the things she made to sell. It reminded that my love of stitching was shaped and moulded by my mother and my grandmother. So many discoveries that had been looked at before but also overlooked. The process of stitching in and around the images, of creating little pockets for the letters was a time of quiet contemplation and reconnection. Something undertaken at a slow pace. A time of experiencing many thoughts and emotions which were literally stitched into my work. My lens had become stuck in one position for so long but I know for sure that working creatively with memories, needle and thread took me somewhere that simply looking at photos never has. This post is testament to a journey of rediscovery and reconnection. How the simple act of stitching led to the formation of a different, happier and more balanced perspective of my relationship with my mother. Literally a process of gathering different threads to create something new.